NorthBay Hospice & Bereavement benefits in a big way from the annual Solano Wine & Food Jubilee. Such success is great news for NorthBay Hospice & Bereavement, as Hospice programs benefit from the funds raised during this spring-time event. “Our community really came through for the Jubilee and for their support of Hospice, which helps care for families in their time of great need,” Johnson said. “With such broad-based support as this, it further proves that our community is one that truly cares. “More than 2,000 people gathered under the big tents at the Nut Tree, where first they noshed, socialized and then later danced to the music of popular Latin salsa band Sapo Guapo. At the Jubilee, guests were invited to sample a wide array of wines, brews and tasty foods, poured and plated by representatives from more than 130 vendors. A silent auction offered items as varied as movie and theater memorabilia, collections of wines, exotic gift baskets, jewelry and collectibles. The cash raffle’s grand prize of $10,000 went to Fairfield resident David Bast, while Cathy Sacca won the Nut Tree shopping spree. The date for next year’s event has not yet been set, but will soon be posted at www.wineandfoodjubilee.org. Solano Imaging Medical Associates— Jim McMahon, M.D. 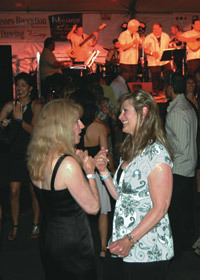 For a complete listing of sponsors and participating vendors, visit www.wineandfoodjubilee.org.